Check out this 1936 Fairbanks Morse Model 32D! The audience here is loving this exhibition, and the ground is shaking from the sheer power of the beast. The power showcased here is tremendous, and the engine note keeps up an almost musical beat. The machine’s size alone is impressive. 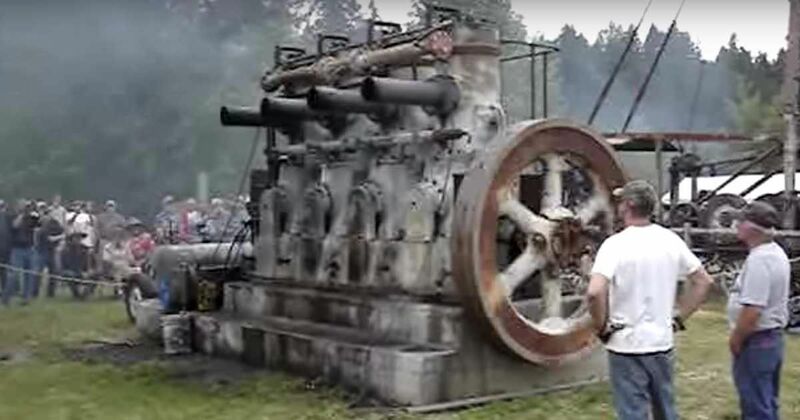 This engine is owned by the Pottsville Historical Museum in Oregon, but is only occasionally operated. Just watch this old boy run! It’s mesmerizing! According to Old Machine Press, Model 32 engines were in service for years in rock crushing plants, textile mills, flour mills, manufacturing plants, cotton gins, power stations, ice plants, seed oil mills and drainage pumping stations. To keep the engine running for so long in pristine condition, at 10,000 hours of operation, the piston pin needle rollers need to be replaced. At 20,000 hours they need to be replaced again and a 180-degree rotation of the piston pin must be performed. At 40,000 hours (around 4 and a half years of continuous use), the bushings and piston pin need to be replaced completely. The Model 32 was built up into the 1940s and saw regular service into the 1970s. Delta, Colorado has three engines are on standby as back-up power generators!